What Is The Best Way To Transport A Paddle Board? Stand-up paddleboarding bas become one of the hottest new ways to get out and explore on the water. Many love paddleboarding because they can bring their furry companion along (bring their lifejacket! ), workout different muscle groups than other water sports, or experience a new perspective of their most traveled lakes, rivers, and more. 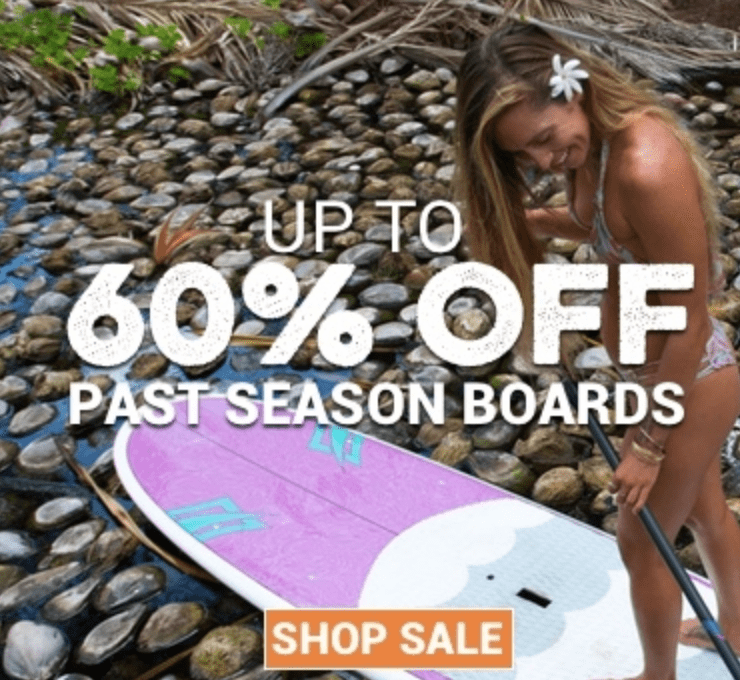 While you may be excited to explore a new challenge with stand up paddle boarding, you’ll probably find yourself less excited to figure out how to transport your board to and from the water. Within this post, we will explore some of the best ways to transport your SUP equipment so you can spend less time fighting it and more time riding it. What If You Need To Haul A Lot Of Paddle Boards? One of the first things to consider when identifying what kind of system you need to get your board(s) from point A to point B is to know just how many boards you’ll be transporting. If you have a number of stand-up paddleboards you’ll be responsible for, you might consider the Yakima Rack and Roll trailer. The trailer is designed to hold up to five boards and can support up to 250 pounds. 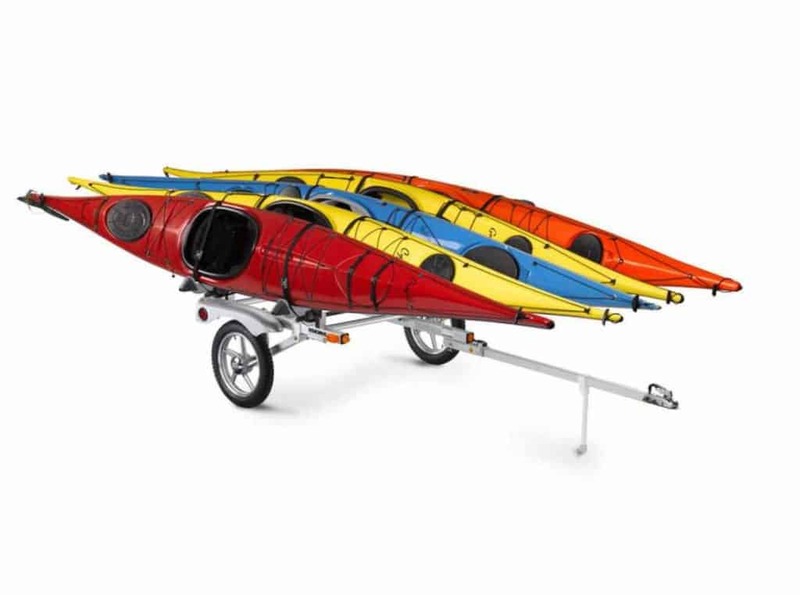 Another nicety of this trailer is that you aren’t limited to one form of equipment as you can attach kayaks, bikes, and other equipment just as easily. The trailer is also rugged enough that it can follow you along a variety of trails and roads that you might have to traverse to locate that perfect launching point. I will say that this is one of the more expensive options. To find out more on price and options you can check it out here. If you won’t find yourself being responsible for an entire group of stand-up paddleboards then your options for transporting your equipment take on more common avenues. As we’ll cover momentarily, a roof rack system is a perfect way to load up your paddleboard, but what if your vehicle doesn’t come equipped with one? Don’t stress, there’s a solution: The SeaSucker Paddleboard Rack. 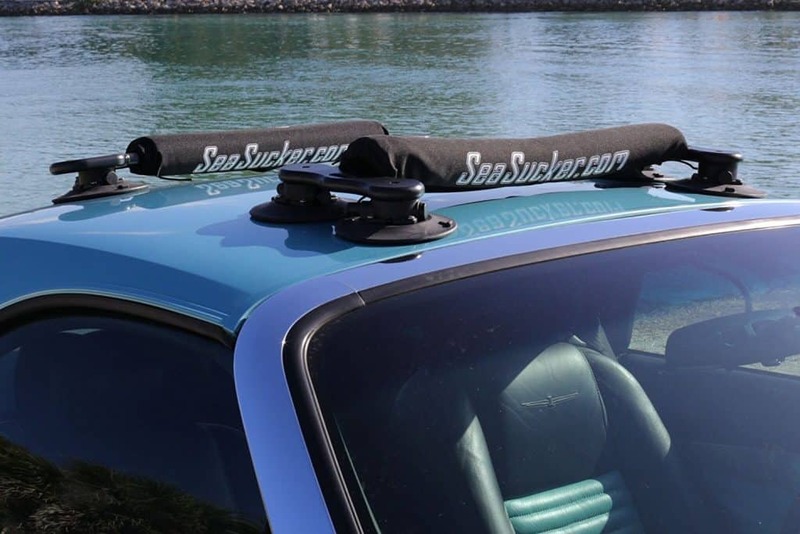 The SeaSucker Paddleboard Rack utilizes vacuum mounts (6 inches in length) which are rated at 210 pounds of pull-strength. 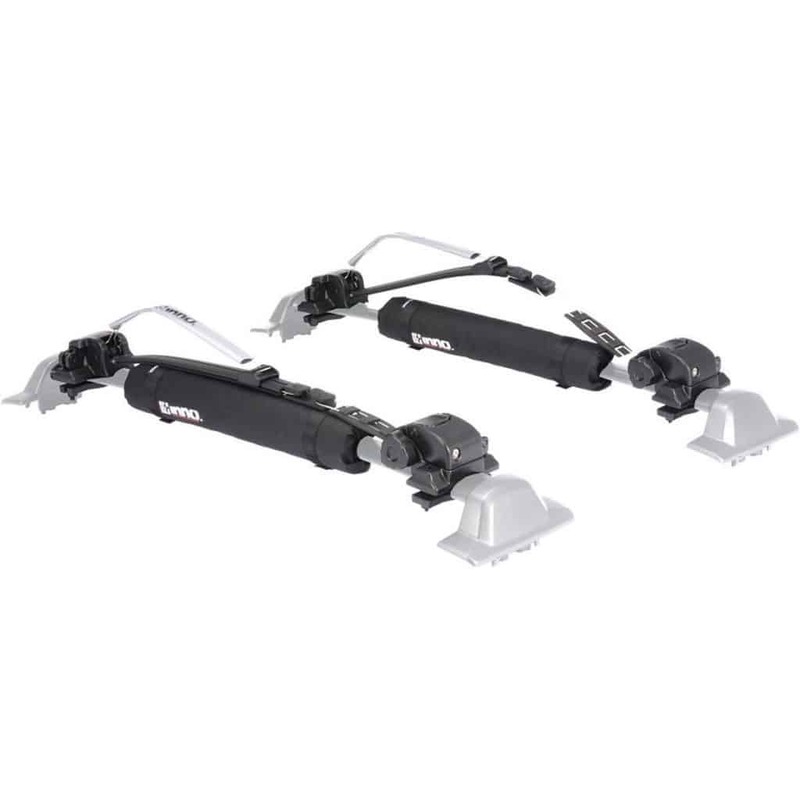 These mounts quickly attach to your vehicle and includes wrap around pads and extendable bars for your board. Use the two cam-buckle straps (10 feet each) to secure your board(s) in place. 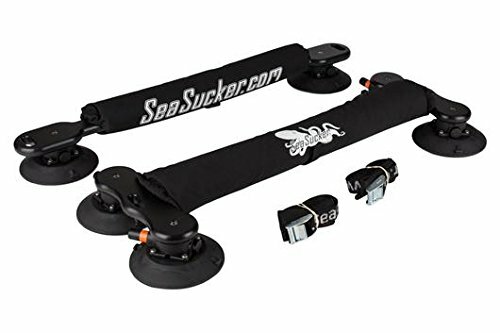 Other well-known providers such as Yakima or Thule also produce mounts, crossbars, and other equipment you can install onto your vehicle; however, the SeaSucker SUP Racks provides everything you need in one device and can be completely removed from your vehicle at any point that you’re not transporting your board. If your vehicle already comes equipped with a roof rack system then there are a variety of methods you can use to load-up and transport your SUP. Identifying the right equipment is a combination of your budget and how taxing your drive to the water may be. One of the cheapest options you can explore is a somewhat simple strap-down method. By finding a few foam surf pads that are built specifically for stand-up paddleboards, you can ensure that your board will be protected while being securely strapped down. Be certain that you’re not just buying a surf pad for a typical surfboard as stand-up paddleboards are generally much wider than a traditional surfboard and, therefore, the padding will leave important parts of your stand-up paddleboard exposed to the roof rack system itself when being strapped down. 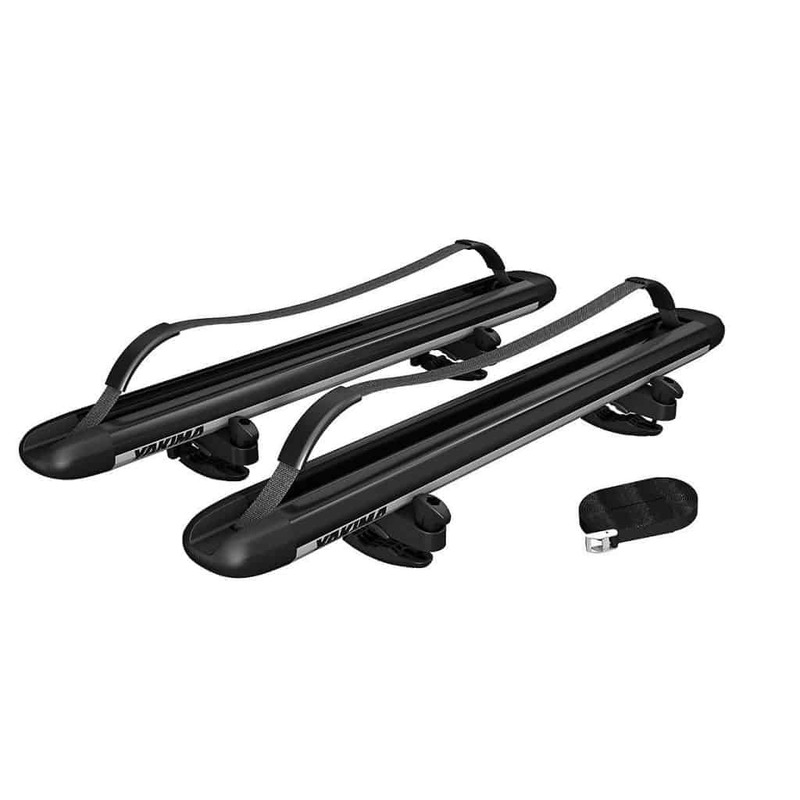 It is also important to ensure that your roof rack system is properly padded for the same reason that you want to eliminate rub between the rack, itself, and your stand-up paddleboard. There are a variety of wrap-around pads, including crossbar padding, such as the Yakima SUP 30, that are ideal for this very purpose. NRS roof rack pads can also be used for this purpose. The NRS Barrito pads are made of neoprene which is durable and tightly absorbent (so those bumps along the road won’t leave you worrying if you’re creating separation between the board and the rack system). The NRS Barrito pads come in lengths of 22 and 32 inches. Since, as we noted above, stand-up paddleboards are wider than traditional surfboards, we suggest you use the 32 inch padding if your vehicle’s rack system is wide enough to support it. Always be sure, regardless of which rack padding you may choose, that the padding fits the bars your rack system utilizes. In other words, if your system uses square bars, a rounded pad may not fit securely which becomes counterintuitive to holding your stand-up paddleboard in place. By keeping both the rack and the paddleboard padded properly, you not only eliminate the chance for rub during transport, but you can confidently strap the equipment down as tightly as necessary to avoid wind-push and other dangers while on the open road. Another important part of this approach is finding the right straps. There is an almost endless number of tie-downs and straps available, so making sure you’ve found straps that are ideal for keeping your paddleboard securely in place is essential. Thick straps with noticeable padding and buckles (cam buckles are most ideal) should be the priority. Not only can you obtain leverage in tightening these as thoroughly as necessary, but you also can avoid scratching your board in the process. 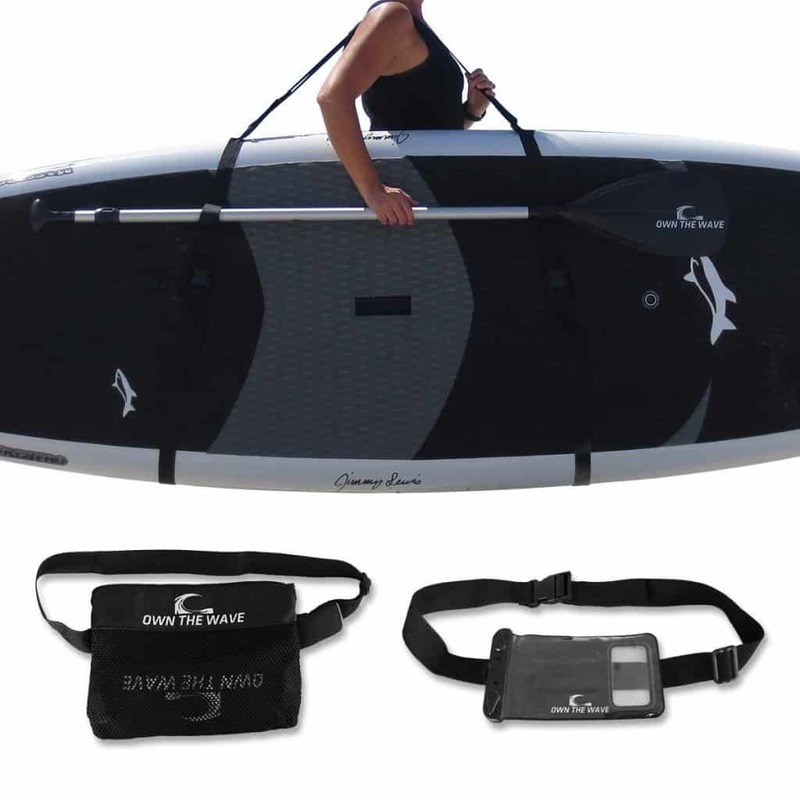 Own the Wave offers a “Deluxe SUP Carry Straps” which includes thick, padded straps that are very durable. Additionally, the pack also has a padded area which is idea for carrying your board over your shoulder or hanging your paddleboard on a wall when not in use. Not only do you get the benefits of a well-crafted strap to secure your board during vehicle transport, but with the padded shoulder section, you can also transport your board from your vehicle to your launching point a bit more easily. If you choose to make use of a utility strap, ensure that the components involved are high quality. Riverside’s Heavy Duty Utility Straps incorporate galvanized steel (for the buckles) and beefy webbing that won’t tear when you put your weight into really maxing-out the tightness of your strap-down. 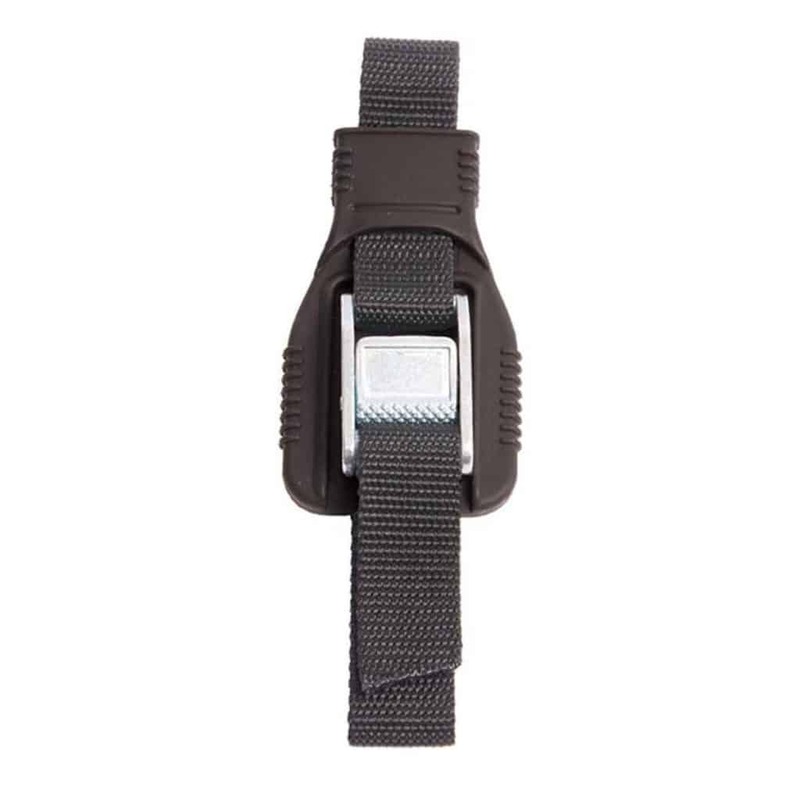 Additionally, while these make for a great way to secure your stand-up paddleboard, you can use these straps for any other variety of means, including kayaks, camping equipment, and more. This strap-down method is a quick, budget-friendly way of securing your stand-up paddleboard, especially for quick, easy drives to your launching point. If you are concerned about highway speeds or wind impacting the security of your board, you can consider adding nose and/or tail tie-downs. Yakima offers a SUP Brah Nose/Tail kit that is great for ensuring winds won’t push your paddleboard around when you increase your speed. If you’ve got a bit more budget or you find that you’re committed to transporting your stand-up paddleboard and not various other outdoor equipment, you might want to invest in SUP-specific carriers. Not only will these systems supply all the necessary padding, straps and securing equipment, they often utilize these in a far more efficient and convenient manner. 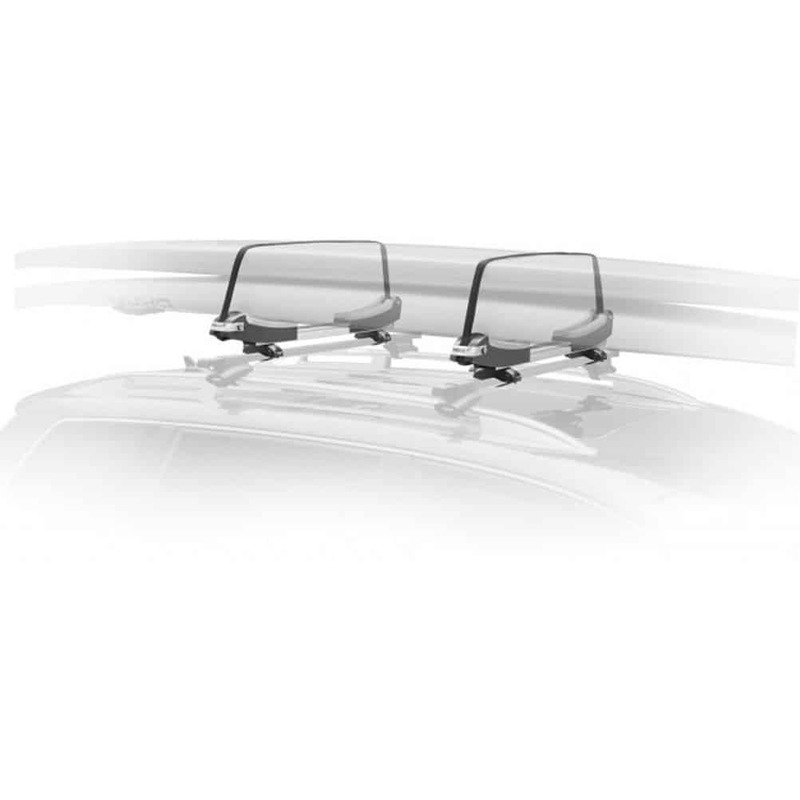 Top brands such as Yakima and Thule offer SUP-specific carriers with nice amenities. The Yakima SUPPup carrier system can store one or more stand up paddleboards, is designed to work with any sort of crossbar system (round, square, etc. ), and extends up to 34 inches wide. The Thule SUP Taxi system carries one or two paddleboards, also extends up to 34 inches, and installs with any crossbar system, as well. The benefits of this system is that it has a spring-loaded locking cam feature to keep your boards safe. A third option is the Inno SUP Locker. Using a universal mounting system, this kit will accommodate up to two paddleboards and uses a ratcheting strap to secure boards in place. This will also fit most crossbars on the market. So far we’ve covered a variety of ways to safely and securely mount your stand up paddleboard(s) to your vehicle; however, it’s also nice to have an efficient and effective way to transport your board to your launching point. Whether you are lucky enough to live within walking distance of your favorite launching point or you are simply looking for a convenient way to get your board to the water after you’ve removed it from your vehicle, the pull-cart method is a great choice. 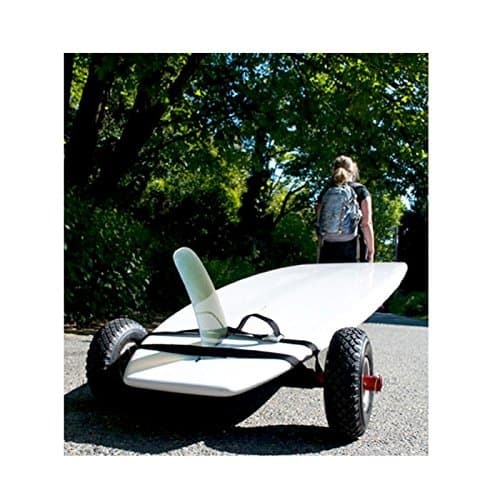 Finding a pull-cart that is designed specifically for SUP’s means ensuring there is sufficient width, a durable frame, large enough wheels (to handle some of the less-forgiving terrain you may encounter on your way to your launch point), and a method to secure your board to the cart. The SoulMite SUP Cart from Seattle Sports provides all of these in one well-crafted package. Another great option is the SUPXpress by Surfstow. 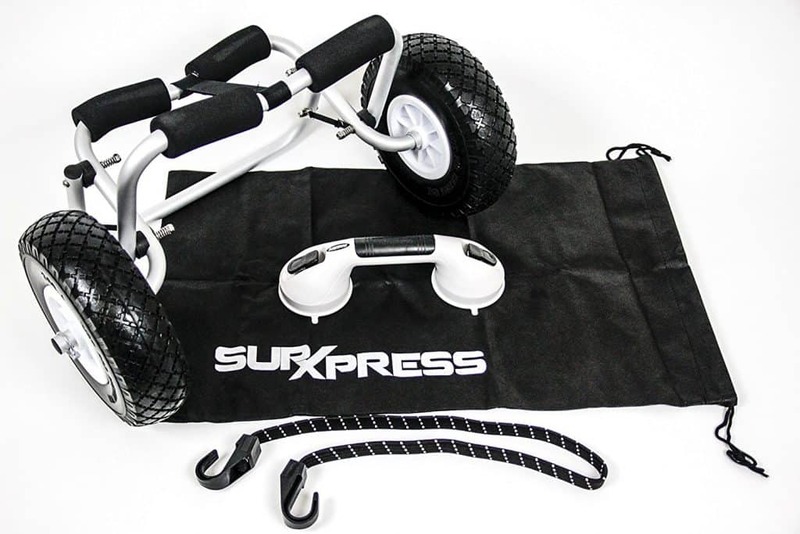 If you’re not one to limit yourself to one activity, there’s even a product called SUP Wheels which allows you to attach your stand up paddleboard pull-cart to your bike. 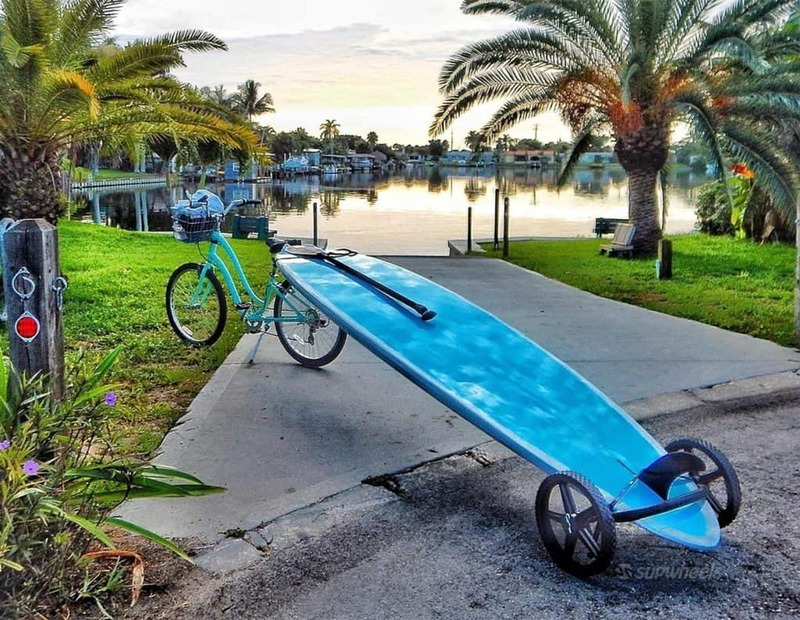 As shown in the variety of methods and products covered above, there are a number of ways to effectively transport your board to the water, regardless of what kind of equipment you do or do not already have. The most essential thing to keep in mind when identifying quality options is to ensure that your paddleboard is secure at all times while also being properly padded. While there are many, many more options in addition to these out there, your ability to find the right equipment boils down to what your specific transportation needs are. So find the best SUP products for you so that you can spend less time worrying about how to get to the water and more time actually being out on it.